A while ago Wisden wrote a report on this web site. I doubt many of you will recall it but a number of sites featuring women's cricket were mentioned and I was pleased to get top billing even if the reviewer did decide I was a stats anorak. I was a little surprised at the comment since stats form a very small part of this site, others covering that aspect of the sport with varying degrees of success, but it did set me thinking about something that the newsgroup guys on the Internet describe as "OT" or "off topic", and that was the use of the word anorak in a derogatory manner. As an amateur astronomer for many years I can vouch for the fact they are a most useful piece of kit. How come they have become so derided? I guess it's by those who prefer to snuggle up in the warmth of their central heating and not to venture outside on cold nights. I was also accused, if that's the right word, of using too many exclamation marks! - oh, dear, there I go again... It seems to me that there's little point in punctuation if you don't use it and it can make an ambiguous sentence rather clearer. I do hope I have not committed in the musings above the common BBC News sin, which seems to occur virtually every night, of putting clauses in an order which actually changes completely the sense of what is intended. For instance I recently heard that "Tony Blair had given a speech on child poverty in York". I suspect, though I can't prove it, that actually he gave a speech in York on child poverty. Only today I heard that a former England rugby captain had removed a metal plate from his leg ... he seems to be a man of many talents. I shouldn't mock ... it is all too easy to make mistakes like this but since I do occasionally do proof reading (or preef ruding as it is known in the office) I am perhaps more sensitive than most to this. I do hope our legislators take more care when drafting laws but I am not confident. Oh, and before you call me a pedant (who is after all only someone who likes to get it right)... I have no problem with split infinitives and the breaking of other 'laws' on grammar providing the meaning is clear. In fact one of my favourite songs starts with the line ... "He had his father's eyes and his mother's point of view..." I only wish I could write in such a neat manner. On a recent radio programme I heard a discussion about sport where some contributors mentioned that many had become more violent in recent times giving rise to some horrifying injuries. They were not at all sure they wanted their children playing them. As I continued listening my mood soon changed to the grumpy old man it so readily adopts these days. As I do risk assessments at work and write health & safety manuals for staff I am always left wondering where common sense has gone. Do people really pick up sharp items by the blade? .. but I have to write a note to say they shouldn't. The whole thing is becoming plain daft. And do people really think life can be risk free? My business partner always claims that if we had invented the motor car in the year 2000 it would have been banned by health & safety legislation... how much more dangerous can you get than sitting in a metal box doing 70mph and passing only inches away from one doing the same in the opposite direction? But just to prove this section is 'on topic' .... my mood was lifted by one speaker who suggested that cricket might be a good idea for the young since it was obviously a sport that had been "invented by mums". After all the players wore "cardigans" (well cable-knit sweaters - but close) and they stop the game to "go in for tea." The remarks brought a smile. With the exception of the occasional fast bowler, players don't usually set out to injure each other either. That doesn't mean you don't have to accept the bruises - it's a game that requires courage - but is it only a matter of time until the nanny state says we must play with tennis balls? There are times when the grumpy old man in me wonders. We'll still drive to games in our cars, of course. And talking about "inventing" cricket, I have learned during the year that the game may well have firm roots in the sheep farming community, with some of the words from that trade and the countryside still in the game today ... anyone know the possible derivation of the word "bail"? Some think it has nothing to do with a bundle of hay or straw but was a link used to close a gate or to join two sections of fence together, the fencing often being a temporary sheep pen. Even the word cricket may derive from crook, and we've all seen stumps in the countryside. I wonder what the thoughts will be about the new ICC Oscars when I next walk the boundary. If you missed them then here are the main recipients. (In batting order) Matthew Hayden, Michael Hussey, Ricky Ponting, Rahul Dravid (capt), Mohammed Yousuf, Kumar Sangakkara (wk), Andrew Flintoff, Shane Warne, Makhaya Ntini, Muttiah Muralitharan, Glenn McGrath. 12th man: Brett Lee. (In batting order) Adam Gilchrist (wkt), MS Dhoni, Ricky Ponting, Mahela Jayawardene (capt), Yuvraj Singh, Michael Hussey, Andrew Flintoff, Irfan Pathan, Brett Lee, Shane Bond, Muttiah Muralitharan. 12th man: Andrew Symonds. The immediate reaction to such lists is to see what you might have done differently. Many I would have no quarrel with whatever. For instance Simon Taufel is certainly the best umpire I have seen on the small screen this year and seems likely to be for many years to come. (Can one person keep winning it even if he thoroughly deserves to? - I suspect not - the gongs will have to be spread around making the list less meaningful as time goes on - we will see...). My personal choice would have been for Jayawardene to be Player of the Year simply because I derive more pleasure watching him bat than anyone else in the men's game currently. It has nothing to do with numbers. Stephen Fleming is also in my opinion the best captain that's been around for some years and it's a genuine mystery to me he didn't receive this one as I find very few dissenters when I offer this opinion. I consider Hussey has earned his place judging from his numbers although I can't claim to have seen him often on the small screen in the corner of my lounge. I am being asked increasingly by newspapers and magazines for pictures which I am usually most happy to supply. However I have noticed a growing attitude among the press - not all by any means! - that the world owes them a living! I say this since some are honest enough to say they don't want to pay - actually they say they can't pay but I doubt their finances are so parlous that is really true - while others offer a few pounds which is fine by me but then ignore invoices and statements and fail to even send a copy of the printed item which is something they almost invariably promise. I have even found pictures of mine appearing on UK web sites without even a polite request having been made. Those of you who know me will be aware I don't carry a camera with a view to making a living from it - I should be so lucky - but I do resent others stealing the profits of my labour. I feel my pictures are mine to give away free or to sell as I choose and my normal criteria is based on whether or not the person requesting is making any money from it in their turn. If they are it seems only fair a small slice should belong to me. You may like to know I have offered pictures for as little as £5 and the invoice has not been honoured! Such an amount is not worth taking through the courts, of course, and the recipient well knows this! And while on this subject, have you ever thought of sending a picture to the BBC following the "You can send your pictures to..." adverts that appear regularly on their TV channels these days. If you have considered it, be rather wary. What a way to build a huge picture library for absolutely no cost whatever! Any image libraries that currently supply the BBC must be furious. I trust it will mean a reduction in the TV Licence now that they shouldn't have to pay as much for stills. Breath holding is not recommended!! The full terms are available via the BBC but the following extract may be of interest...It is quoted for review purposes. If you submit an image, you do so in accordance with the BBC's Terms and Conditions. news broadcasters who are prohibited from altering the material in any way or making it available to other UK broadcasters or to the print media. I have to make a decision for this coming season and am considering declining any request to provide pictures free from commercial organisations. This would have the unfortunate effect of reducing the publicity the sport gets, even if only in a very small way. I was told only recently that an article would appear in one magazine with no pictures if I didn't supply them free. As it concerned a player well known to me I relented but I am very anxious to know how supporters feel about this and would genuinely appreciate any feedback ... I have to admit to being torn in two directions. I must stress that there are many honorable people around. Cricketing organisations, including the County boards and well known clubs have shown they are people of their word and their requests are always given top priority. During the year I have come across what might have seemed some unusual fixtures while perusing the world's newspaper sports pages. For instance, how about the tour by Japan to Papua New Guinea? If I'd asked you even two years ago to pick a couple of unlikely teams then you might well have said ... "Japan maybe, but PNG ... you must be joking!" Pakistan is now under the wing of the Pakistan Cricket Board. Whether this is a 'good thing' to quote 1066 and All That or not we'll have to wait and see, but they plan to tour South Africa in January 2007. The West Indies seem the most troubled with an almost permanent financial crisis on their hands in spite of a superb performance at the 2005 World Cup for a side that had played so little together and so little international cricket. Hong Kong is also supposed to be a country where the sport is moving apace. If any reader has information on this part of the world I'd be glad to hear from them. Zimbabwe has just announced the formation of a national squad as I type. I have to hope that it suffers rather less at the hands of politics than the men's side but I can't pretend to be hopeful in that troubled country. During an idle moment this summer I wrote down a list of Zimbabwe men who had left the side, and the country, to play cricket elsewhere or give up the sport altogether. The more I looked at the list the more I wondered, given recent form, if the England men could beat them in an ODI. Zimbabwe have thrown away the chance to be a top cricketing nation. With men being less interested in the women's game perhaps the Zimbabwe women have a chance to develop quietly on their own. And now the Swiss have started a team ... I hope they have more luck keeping things going than some European countries have had in the past. On this occasion I can't say that my picture of the year is included because it's a great photo. 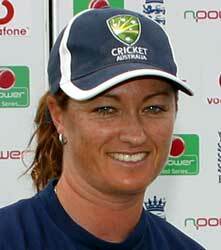 However, it does record a great moment that must be a milestone in women's cricket. It will probably be Picture of the Decade in terms of the history of the game. You don't need me, of course, to tell you what it is - every supporter of the game anywhere in the world must know! It seems that great occasions bring out the best in great players. 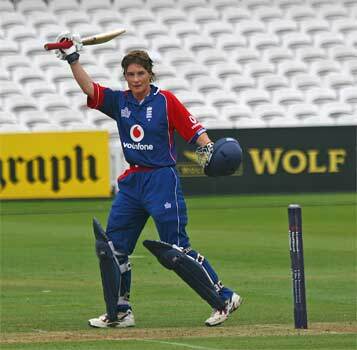 As I mentioned earlier in this piece and although now toppled from my choice for the top spot, I would have said at the beginning of the season that Lisa Keightley's century at the same venue was probably the finest innings I had seen in a decade. Lord's obviously has a magic all its own. 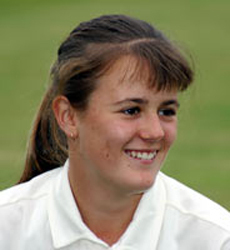 No player has been as consistently successful in an England shirt in the last few years as Claire Taylor and she well deserves the plaque erected in the ground to mark the innings. I can't help but repeat what a pleasure it was to watch her and the rest of the match amid a noisy and enthusiastic crowd as supporters of both sides joked and clamoured. Cricket kit generally is not cheap and I have moaned elsewhere about the cost of getting to matches around the UK, so any help the players can get in terms of equipment is more than welcome I am sure. So as far as I am concerned well done the company (Uplifted Lingerie) for helping out and well done too to the girls above for posing knowing that some flak might well come their way for doing so. After my remarks about the BBC's TMS Message board I guess I'd better not post the URL of this page there. It would be bound to attract the electronic version of the blue pencil! Someone somewhere suggested Kevin Pietersen might not be willing to pose half clothed but then his bank account must look rather healthier (I assume) than any of the individuals above. Or if he did take on such a photo shoot he would expect rather more than the cost of a sport's bra as a fee. It would seem, judging from the provisional programme I have seen for 2007, that an enthusiast will be able to watch four international teams, England, New Zealand, South Africa and Ireland - quite a line-up! The South Africans are only scheduled at the moment to play a Twenty20 in this country during their European tour but it is quite possible other fixtures may be added. No Test matches are scheduled at the moment and when the schedule is a little more settled I will post the fixture list.